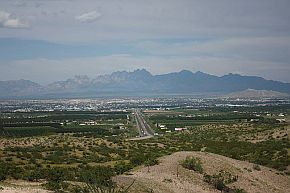 Located at the very southern edge of the state on the border with Mexico, Las Cruces is the economic and cultural center of the Mesilla Valley. The economy of the “City of the Crosses” has a strong agricultural component but is also well represented by the educational, medical and high technology industries. While Las Cruces is home to the modern New Mexico State University and the White Sands Missile Testing Range, it has also stayed true to its roots with an historic downtown that features open air markets, fairs and a wide variety of dining and shopping experiences. The tourist industry is also flourishing with multiple campgrounds, hiking trails and national parks that provide stunning views of he surrounding countryside. There are excellent career and business opportunities in the Las Cruces area for everyone from fledgling entrepreneurs to high tech scientists. It has experienced solid population and economic growth in the last decade and looks to continue the trend.